Paneer Butter Masala (also known as Paneer Makhni) is one of the most popular Punjabi Paneer recipes in Indian cuisine best served with Naan or Tandoori Roti or Paratha. 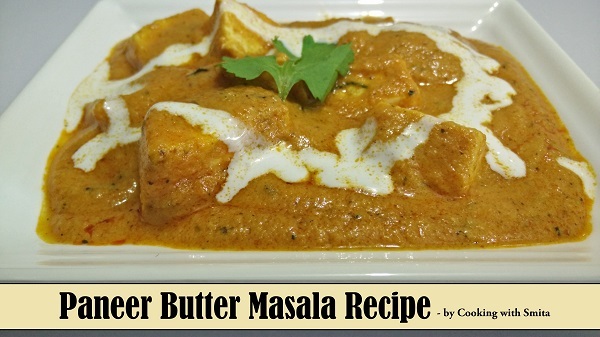 Watch my video recipe and learn how to make Restaurant-style Paneer Butter Masala at home. Add chopped Ginger and Garlic, sauté for 1 minute. Add sliced Onions and chopped Tomatoes. Sauté till Tomatoes becomes soft, stir occasionally; it will take around 4- 5 minutes. Switch off the gas and let them cool down. Add the mixture of Onion & Tomatoes in mixture Jar, add soaked Cashews and blend to a very smooth paste. After grinding filter to strain the mixture, add half cup water and keep it aside. Pass the puree through a colander or sieve and collect it into a bowl. Heat 1 tbsp Oil and 3 tbsp Butter in a non-stick pan over medium flame. Add Green Cardamoms and Kashmiri Chilli powder, mix well. Add gravy and mix well. Add salt, cover with the lid and cook for 10 – 12 minutes. Switch off Gas after 10 minutes and add spices in gravy – Garam Masala, Coriander & Cumin powder and add Honey, mix well. Again cover with the lid and cook for 2 – 3 minutes over low flame. After 3 minutes add fresh Paneer cubes and mix well. Crush Kasuri Methi between your palms and add in gravy, mix well. Add fresh cream, mix well and cook for another 2 minutes without the lid. Don’t cook for a long time as the Paneer will become dense. After 2 minutes, Paneer Butter Masala is ready, switch off gas. Garnish with Fresh Cream and serve Hot with Roti, Naan or Kulcha.